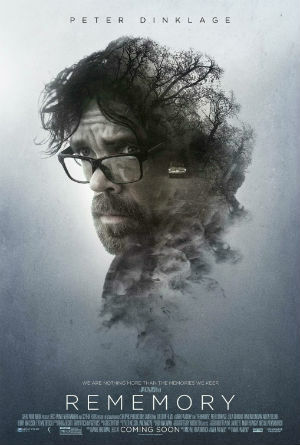 Rememory is fairly standard thriller fare whose gimmick actually gets in the way more than it helps. It centres around a technology which allows the "recording of memories." After the death of the technology's creator, an investigation into his death begins. Rememory hits all the standard beats but never gets into a compelling groove. It never gives us a reason to care who the killer is or why. But the biggest flaw with Rememory is the film's actual gimmick. The technology doesn't really make any sense and the film doesn't give a realistic portrayal of it. Also it doesn't find a way to make the "recordings" we see feel vivid. Director Mark Palansky just takes the most basic of perspectives, first person view point, and other wise films memories exactly as he films the rest of his movie, only in short clips. His rememberors only remember things in short snippets. And the biggest problem with this film, the problem that kept eating at me as I watched it, was how the film treats memories as static, objective things which are deadly accurate and immutable. That's not how I understand memories at all. First of all memories are our understanding of an experience. Second they change over time as we become more removed from that experience. Ask any cop for example. They can tell you if they ask 6 witnesses about a crime they will get 6 different versions of the event. And as time goes on those versions may alter, may be effected by the persons' biases, mental health, point of view, desires, etc. In Rememory memories are like a video camera. The film does nothing to address the etherialness of memory and in ignoring this, reduces itself to a simplistic crime story. Sure the film tries to redeem itself with its sort-of twist ending but that twist still relies on its lack of imagination relating to memory. Rememory is a missed opportunity, both to tell an interesting story based on this concept and to give star Peter Dinklage a captivating role. Unfortunately you will quickly forget Rememory.